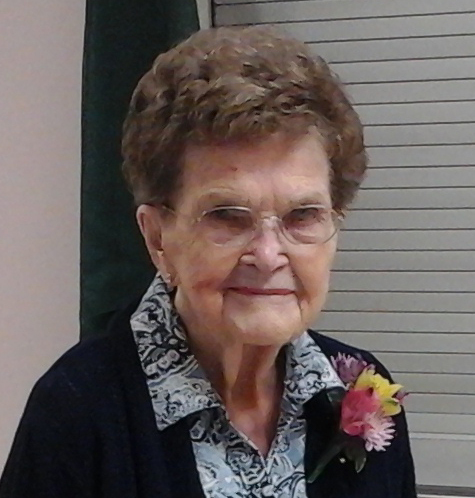 Funeral services for Grace H. Arneson of Albert Lea, MN, will be held at 10:00 AM Saturday, April 21, 2018 at the East Freeborn Lutheran Church, rural Albert Lea. Pastor Matthew Griggs will officiate. Visitation will be held Friday evening from 4 – 7 PM at the Bonnerup Funeral Service and one hour prior to the service at the church. Interment will be in the East Freeborn Cemetery.. Grace died Friday, April 13, 2018 at the St John’s Woodlands Community in Albert Lea. Grace was born March 14, 1922 on the family farm the daughter of Herbert and Ida (Hoverson) Thompson, the seventh of twelve children. She attended the Bell Country School. On March 24, 1940 she was united in marriage to Alton H. Arneson at the East Freeborn Lutheran Church. Grace was a wonderful wife, mother and grandmother and enjoyed spending time with her family. She was very active in Church activities including choir, quilting and the Altar Guild. Grace was a master seamstress and made many bridesmaid and prom dresses. She also enjoyed going to auctions, buying antiques and then selling them on the internet. Grace is survived by her four daughters; Nancy Golde, Alice (Vern) Goette, Marilyn (Gregg) Polk and Darlene (Paul) Diemer. Grandchildren include; Terri (Brett) Hammer, LeeAnn (Steve) O’Sell, Penny (Blaine) Hammer, Cheryl (Rollie) Johnson, Theresa (John) Larson, Bradley Goette, Amy (Randy) Rogers, Anthony (Lisa) Polk, Michael (Danna Nelson) Diemer and Cari Diemer. Great grandchildren include; Tyler (Brittany) Hammer, Shelby Hammer, Nicole, Jacob and Mitchell O’Sell, Mason and Brock Hammer, Michelle and Melissa Larson, Ethan and Garret Johnson, Kady Johnson, Nicolas and Matthew Rogers, Madelaine, Molly and McKinley Polk and Grace Diemer. There are two great great grandchildren; Carson and Kate Hammer. Surviving brothers; Earl (Beverly) Thompson, Paul (Mary) Thompson and David (Marlene) Thompson, one sister Elaine Erickson, sister in law Dorothy Westland and numerous nieces and nephews. Grace was preceded in death by her parents, husband in 1988, mother and father in law Harry and Alice (Jensen) Arneson, brothers Howard (Bernice) Thompson, Everett (Olive) Thompson, Wallace (Helen) Thompson, Palmer (Marjorie) Thompson, sisters Dorothy (Raymond) Jerdee, Carol (James) Bottelson, Harriet (Aleck) Broskoff, brothers in law; Robert Erickson and LuVerne Westland, sisters in law; Arlene (Alvin) Jensen, Carol (Earl) Westland, Marion (Robert) Frydenlund, son in law Donald Golde, grandson Brian Goette, granddaughter in law Lindsey (Loehr) Diemer and many nieces and nephews.